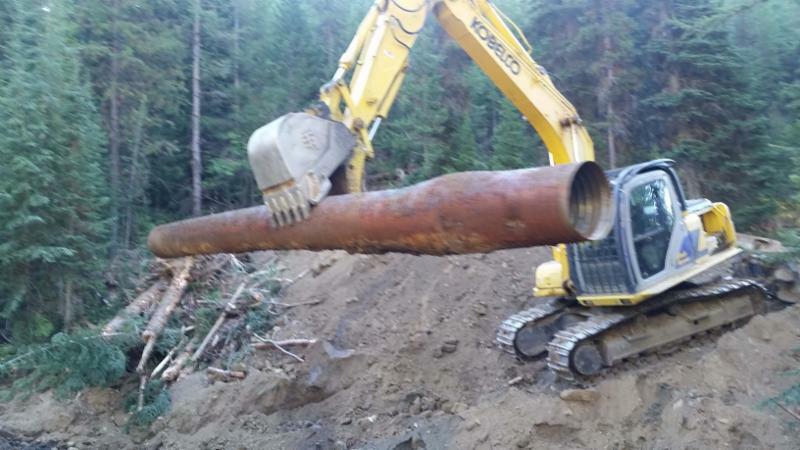 Clark Fork drainage to be featured at February 15 BRTU meeting. What image does your mind conjure up when someone refers to the Clark Fork? The mine wastes in the headwaters? The river that runs through Missoula? The broad flats with Missouri-like fishing for tricos? The warmwater sloughs that are pike lairs below Missoula? Well. All of these are correct. The Clark Fork Drainage has about 28,000 miles of stream in Western Montana and Northern Idaho that range from tiny to enormous. The Clark Fork is also the largest drainage in Montana. 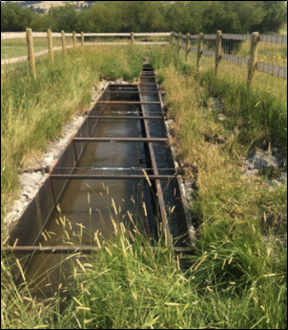 Since 1985, the Clark Fork Coalition has been doing significant conservation work in the entire drainage, forging links between communities, conservationists, agriculture and governments. 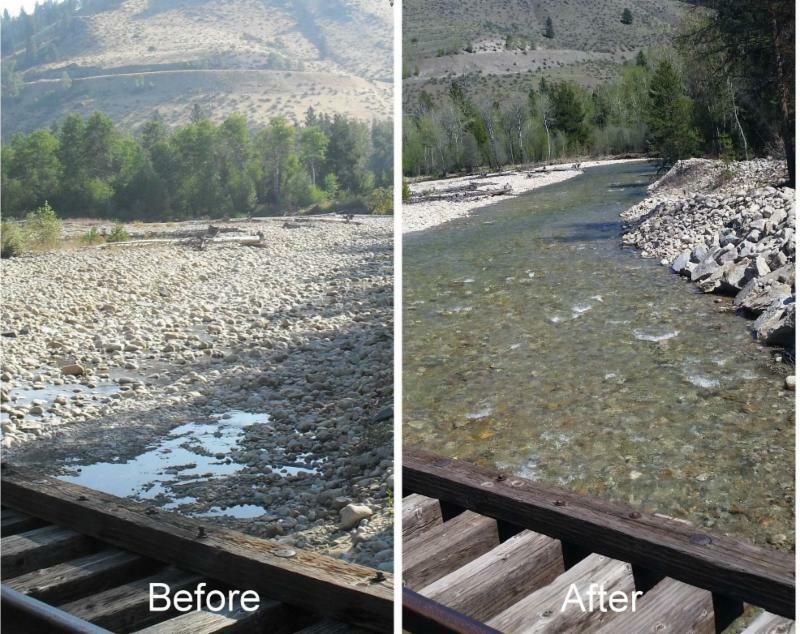 In recent years the Coalition has accomplished some very successful projects in the Bitterroot on Lolo, Tin Cup and Lost Horse Creek. At our Thursday, February 15 meeting, Jed Whiteley will present the program. Jed is the Project Manager and Monitoring Coordinator for the Coalition and he will give us an overview of the Coalition’s work and highlight their Bitterroot projects.The meeting starts at 7:00 pm at the Hamilton Elks Lodge, 203 State Street. There is no charge for admission and the public is invited to attend. And remember, we will be having dinner with Jed and a couple of other CFC hardies at Spice of Life at 5:00 pm before the meeting. Long-time BRTU supported Karen Suennen will be donating 10% of the proceeds to our club. So, please come join us for dinner. For additional information, please contact Greg Chester or Marshall Bloom. Posted in Bitter Root Chapter of Trout Unlimited	| Comments Off on Clark Fork drainage to be featured at February 15 BRTU meeting. The 2018 Bitterroot Buggers classes will be starting later this month. 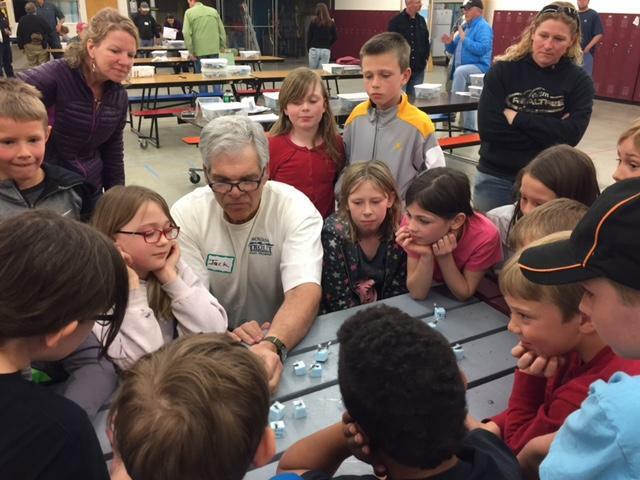 This is going to be the 21st year of BRTU getting young people started in fly tying, flycasting and conservation. 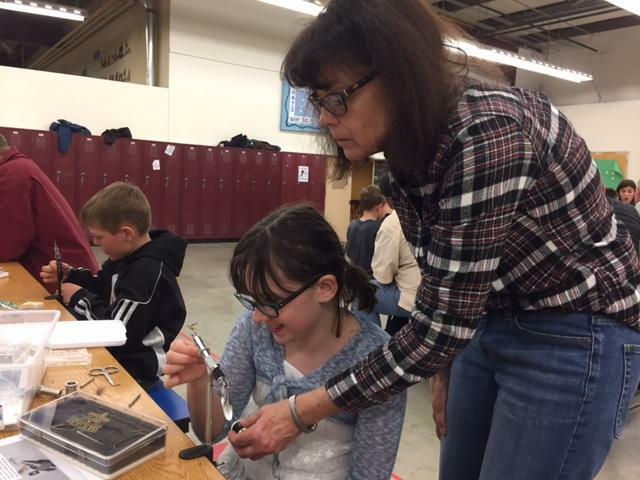 we have kids from all over the valley signing up.The kids in these classes are the ones who are going to be taking care of our trout and river in years to come. We really need dedicated and regular volunteers to make this program go. You don’t need to be a tier to be a big help, and help is appreciated for any class! Every night you help out, you get a raffle ticket for a Monte Dolack print! Plus, we have been going over to the Wine Cave for a libation after each session. All classroom sessions will be from 6:30 – 8:00 PM in the Hamilton Middle School located on Madison between 5th and 6th St. Enter through the blue door with a yellow flower. BRTU to partner with Montana TU on irrigation projects. 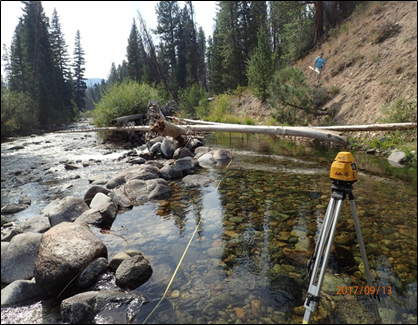 This past summer, Christine and Rob were hired by the Bitterroot Conservation District to inventory diversions in the Upper Bitterroot, looking for opportunities to create more fish friendly diversions or remove in-stream barriers to migration. The project is called “Upper Bitterroot irrigation diversion inventory and prioritization”. BRTU board member Dave Campbell met with Christine, Rob, Chris Clancy and Mike Jakober and Cole Mayn from the Bitterroot National Forest to define forest priorities in connectivity issues between headwaters and tributaries and the main stem. There are plenty of areas where connectivity is an issue as well as stream temperature. The goal is to identify and prioritize where real progress can bemade and then our chapter is anxious to improve the connections on those streams. Stay tuned as this worthwhile project moves ahead. For information, please contact Dave Campbell. Posted in Bitter Root Chapter of Trout Unlimited, Call to Action	| Comments Off on BRTU to partner with Montana TU on irrigation projects. Our 38th annual banquet is set for Friday, October 13 at the Bitterroot River Inn in Hamilton. The banquet doors open at 5:00 pm. Ticket sales are moving briskly and we have a terrific assortment of premiums guaranteed to interest just about every taste! That said, there is one feature of this year’s banquet that is really drawing a lot of attention. John and Elna Foust are the indisputable First Family of Fly Fishing in the Bitterroot. At this year’s banquet, BRTU will be presenting John and Elna with a Lifetime Achievement Award for their contributions to fly fishing, fly tying and conservation. And to top it off, John has donated one of his custom folding fly boxes with more than 4 dozen flies from his personal collection for our Live Auction! So if you would like to help us pay tribute to this special couple, plan on attending the banquet. The great picture of John is from a Ravalli Republic story that was written a few years ago. CARDO drawing for a custom bamboo flyrod crafted by Robert A. Ratcheson. Here are the Live Auction premiums for you to check out. And these are just a small fraction of the outstanding premiums, like a complete travel outfit with an Echo rod, Lamson reel, line, leader and travel case, and a Sage rod/Abel reel combo, a pizza dinner for 6, a fabulous lunch, outrageous wines, a Yeti cooler, gorgeous photographs, gift baskets and more. Tickets are available at Freestone Fly Shop and several other shops in the valley. They are $50 a piece and they are going fast. There might be a few tickets left to purchase at the door, but last year’s was a stone-cold sellout, so don’t dilly dally. For more information or to volunteer to help, please contact Greg Chester at gchester55@aol.com at or Ria Overholt at riaoverholt@gmail.com. Hamilton. Tickets are on sale already and incredible donations are starting to come in! We are going to have some very unique premiums this year. One item that is already drawing a lot of interest is a gorgeous split-bamboo rod made by long time BRTU member Bob Ratcheson. Bob has crafted a 7 foot 2 inch 4 weight rod with 2 tips specifically for our banquet. He says this rod has a delicate action and is not intended for fish over 24 inches. The rod is available as a CARDO drawing so that everyone has an equal chance. Cards from a special deck of cards will be $50 and we will draw the winning card when the deck is sold out. If you want to purchase a card now, please contact Ria Overholt. Right now it is still possible to request your lucky card from the deck. I mentioned in the last issue that we will be honoring Elna and John Foust with a Lifetime Achievement Award recognizing everything that they have done for the promotion of flyfishing in the valley. I can now report that the 2017 Golden Trout Award will be presented to the Keystone Enrichment Program of the Hamilton School District. Keystone is our long-running partner in the Bitterroot Buggers program. If you have any questions, or would like to make a donation or help at the banquet, please contact Ria Overholt, Peggy Ratcheson or Marshall Bloom. You can also complete and email one of these folks a donor/sponsor form. • Comprehensive curriculum covering all aspects of fly fishing. Casting instruction provided by Chuck Stranahan and his expert staff. Sign up deadline – April 15!! Limited enrollment so sign up early! Chuck Stranahan’s Flies and Guides in Hamilton. 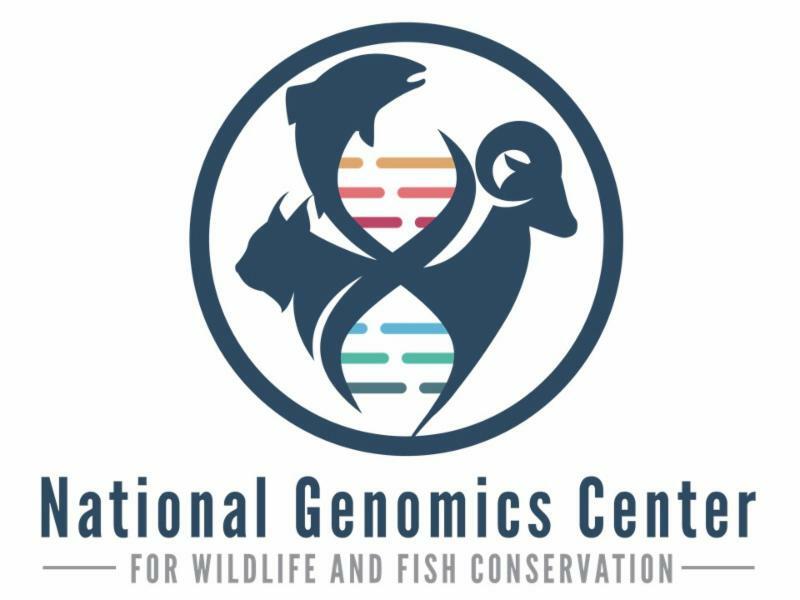 Kellie Carim, PhD, a scientist at National Genomics Center for Wildlife and Fish Conservation will present the program at our next BRTU meeting, titled “eDNA: tracking trout with DNA and modern molecular biology.” The meeting is Thursday, November 17, and starts at 7:00 PM at the Hamilton Elks Lodge at 203 State Street in Hamilton. What is eDNA and why is it of interest to TU members and conservationists? eDNA stands for environmental DNA and reflects the latest modern methodology to be employed in fisheries biology. 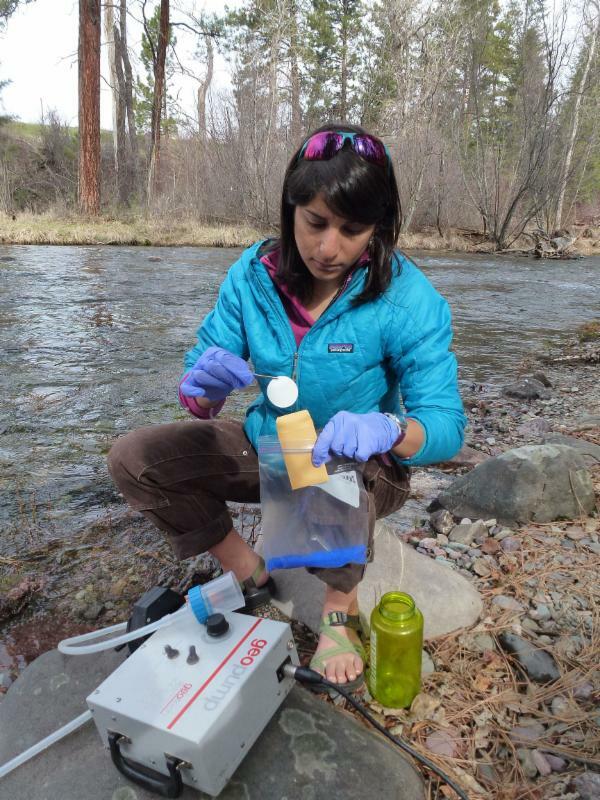 As you can see from the photos that Mike Schwartz took of Kellie at work, the scientists go out to a stream and using carefully designed protocols run samples of water through a special filter. Back in the lab, scientists like Kellie extract the DNA from the minuscule amounts of mucous, scales, cells and biological debris that have been trapped on the filter. Then using the very latest and unbelievably powerful DNA technology and associated computer analysis, they can determine the types of fish in a particular section of river or creek. 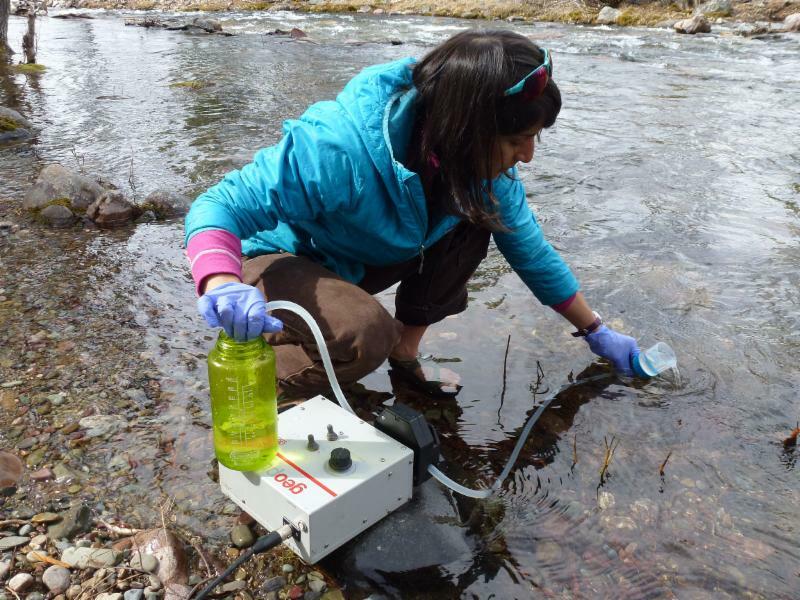 If looking for native cutthroat trout in a river system is like trying to find a needle in a haystack, eDNA technology has the effect of making the needle enormous and the haystack very small. This site has a nice description of eDNA and Kellie’s work. With the results of the eDNA studies on a stream, MFWP biologists can now confirm the presence of native or non-native fish and focus their management and survey work. The method can also be used to look for invasive non-native aquatic species, like weeds and zebra mussels. Chris Clancy tells me that the method is even being used here in the Bitterroot. So does this mean we will soon have a pocket test to see if there are trout in that run where we can’t get a strike? Come to the meeting and find out! And, remember! We will be having dinner with Kellie at Spice of Life at 5:00 pm before the meeting. Long-time TU supporter Karen Suennen will be donating 10% of the proceeds to our club. So please come join us for dinner. Streamflows and Weather Prediction. Cross Your Fingers! The amount of rain that we had last month in the Bitterroot and other parts of Western Montana was truly astounding. Many locations in the Flathead had record high amounts of precipitation and streamflows were running well above average. This story from the Missoulian gives a good summary of rainflow as of November 1. The Bitterroot River hydrograph at Darby shows how good the flows there have been, but you can also see how quickly the river drops once the rain stops. The flows in the Clark Fork near Missoula are really something. 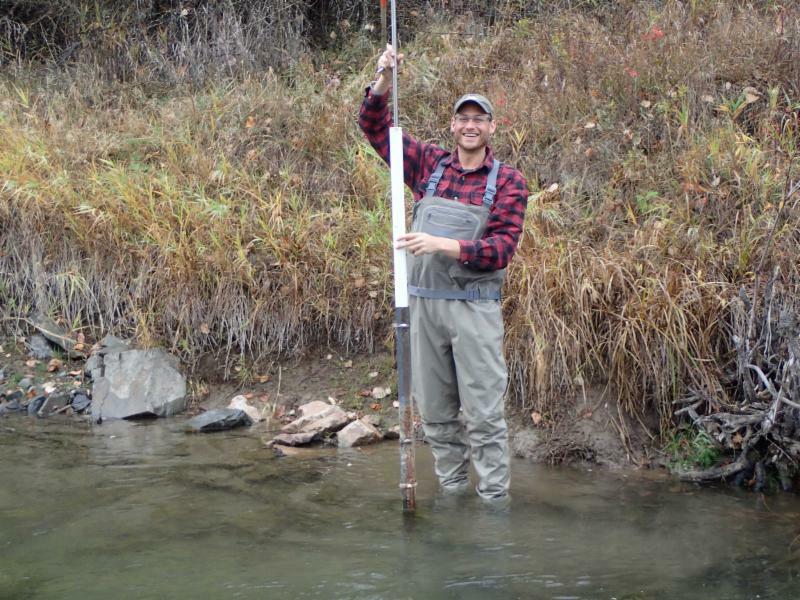 You can go to this USGS site to check out data for all the streams in the state. It will become apparent that not all streams have been as fortunate as the Kootenai Clark Fork drainages. All in all, most would agree that we are going into winter with well hydrated systems! This link is to the DNRC’s Basin by Basin Water Supply Report compiled by Ada C. Montague, who is State Water Planner for the Clark Fork & Kootenai Basins. The report may need some revision after the deluge of October, but it is informative. Of course, the situation next year depends on snowfall this winter, what spring is like and if we get rain next summer. The National Weather Service in Missoula recently issued its forecast for the coming winter. You can see their predictions for the Northern Rockies at this YouTube site. This week’s photo was submitted by Tonia Bloom. The picture was snapped by during a gorgeous fall float on the Lower Clark Fork in late October. Old Esox viciously struck an 8 inch heavily-weighted tandem streamer fly lobbed into its lair on a 9 wt rod with a steel tippet. This was a very healthy specimen estimated to be over 20 pounds and close to 40 inches – the largest fish that Jack or I had ever seen caught on a fly. Doubtful this fish got so big eating tricos or PMDs. 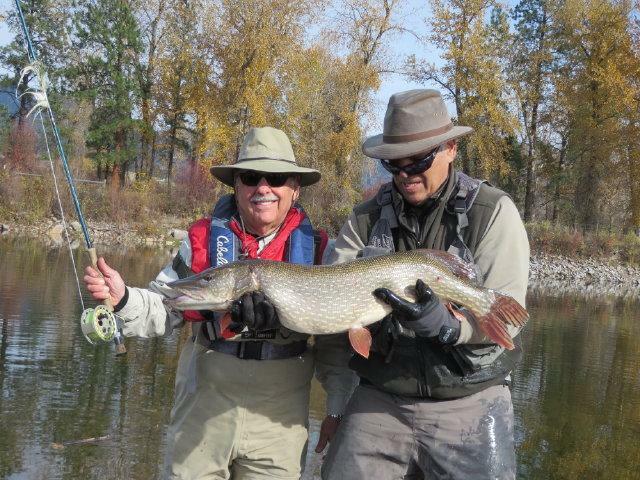 A couple of days later as I was showing the photo to Jim at Freestone Flies and Guides, he showed me a photo of 4 20+ inch pike caught by an angler wading downstream from Stevensville. It is hard to know if the marked increase in pike being caught indicates expansion in range and numbers, or people looking for some variety in angling experiences. Time will tell. In the meantime, if you hear of a pike being caught upstream of Stevensville, please email me. Perennial attendees at our BRTU banquets may have noticed that a regular figure wasn’t there. Retired Marine Corps Captain John Hickman died on October 13. John had been in failing health for the last couple of years. Prior to his death, his family and friends had donated some of John’s well-cared for tackle to BRTU and they were used at the banquet. John could be seen at the banquet prowling the items and filling out raffle tickets with his pipe bobbing in his teeth. Unfailingly friendly and polite, he was usually in the company of another retired Marine family, Jim and Marilee Shockley. We would like to acknowledge John, his family and his friends for their support and friendship over the years. Copies of the limited edition “Bitterroot River-Lost Horse Bend” by Monte Dolack are now available at Joe’s Studio. 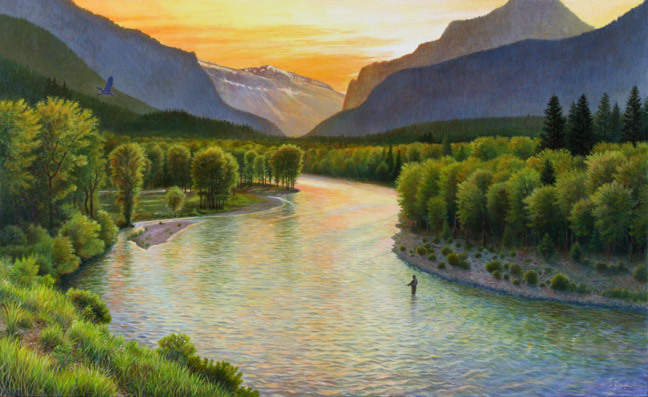 BRTU commissioned Monte Dolack to create this iconic print of the Bitterroot River. All prints are numbered and signed by Monte. Unframed prints are $175 and all proceeds support BRTU efforts to protect trout and streams. Unlike many groups, BTRU has no paid staff. We are an entirely volunteer organization. We are always looking for new members to get involved in projects or to join our board and assist with maintaining our focus on native fish, clean healthy streams and education. If you would like to help out, please contact BRTU Chapter President Greg Chester at gchester55@aol.com. We could sure use your help! In other words, how about putting a little “U” in BRTU? If “U” are not already a member, “U” can join TU today by going to the Montana TU website http://montanatu.org/ Our chapter number is #080. For your information, here is a tabulation of our current hard-working BRTU officers and board members. October 14 BRTU banquet: better get your tickets! The 37th annual BRTU banquet is less than 2 weeks away and tickets are really moving!! This year the banquet will be on Friday, October 14 at the Bitterroot River Inn, and will start at 5:00 pm. Tickets are on sale now in Hamilton at Freestone Fly Shop, Chuck Stranahan’s Fly Shop and Angler’s Roost, and in Darby at Bitterroot Fly Company and Freestone Fly Shop. The price of tickets remains at $50.00. There are still tickets left and they will be available at the door, but we are looking at another sellout. So, you had better get your tickets and make your plans to attend now. This year we have some amazing Live Auction premiums including float trips donated by Jack Mauer, Scott Nicolarsen, Rick Thomas, and Blue Ribbon Flies in West Yellowstone. On top of that, Dave and Chris Decker at The Complete Fly Fisher, Craig Fellin at the Big Hole Lodge, and the exclusive Ranch at Rock Creek have donated premiums that include accommodations and fishing. There will be artwork, photography and pottery donated by local artisans, rods by Orvis, Sage, R.L. Winston and Loomis as well as Orvis reels, Atlantic salmon flies, and Simms gear. Several gourmet dinners are on tap, one with soft piano jazz. It is not possible to list everything, but here is a list of Live Auction premiums. This year we will be doing a paddle call to support our flagship Bitterroot Buggers program that is approaching the 20 year anniversary. We will debut a video about the Buggers produced and directed by one of our high school board members, Minica Casbara. The Buggers have made a real difference for a lot of young people and you wont want to miss this video. Remember that in addition to being one of the most fun events in the Bitterroot, the banquet is our only fund raiser of the year. So our success is completely dependent upon your generosity! This stunning pen and ink drawing and wash “Raptor in Flight” has been donated by artist Susan Connell and will be featured in the Live Auction. You can read more about it in the attached list of Live Auction premiums . A nother unique Live Auction item “Match the Hatch in 14 Karat.” This premium features 4 iconic Bitterroot dry flies tied by legend John Foust on 4 14 karat gold hooks made by local jewelry artist Cindy Mikesell. Each fly has a sapphire at the point, and they can be used as a pin or a tie-tack. The flies are displayed in a small flybox of exotic hardwoods donated by Jay Haglund and Donna Woodroof. It is doubtful anyone would fish with these treasure, but they are really beautiful! For more information on the banquet or to volunteer as a helper, please contact Greg Chester, Marshall Bloom or Peggy Ratcheson. Posted in Bitter Root Chapter of Trout Unlimited, BRTU Annual Banquet, Event	| Comments Off on October 14 BRTU banquet: better get your tickets! The list of programs for BRTU’s 2016-2017 has been finalized. The meetings are the 3rd Thursday of the month through April, 2017, excluding December 2016. All meetings start at 7:00 pm Hamilton Elks Club, 203 State St in Hamilton. The public is welcome to attend and there is no charge for admission. To join or for additional information about Trout Unlimited, go to www.montanatu.org, or contact Greg Chester at (406) 363-0033 or gchester55@aol.com. And don’t forget we will be having dinner with the presenters, BRTU members and friends at 5:00 pm at the Spice of Life. Long-time BRTU support Karen Suennen will donate 10% of the proceeds to BRTU. According to a news article in this week’s Bitterroot Star, a proposed land swap near the Stevensville bridge would lead to an improved Fishing Access Site (FAS). State Senator Fred Thomas made the proposal to the Stevensville City Council on behalf of the landowner. The land trade would be between the City of Stevensville and the land owner, but a Memorandum of Understanding would commit MFWP to develop and maintain the project under its FAS program. The proposal envisions parking spots for both truck/trailer units and single vehicles, and would include a concrete latrine. MFWP supports the proposal, as do former BRTU Chapter President Eddie Olwell, and the Ravalli County Fish and Wildlife Association. BRTU has not yet taken a position on the project, and no action was taken at the meeting by the Stevi City Council.